Younger campers, grades K-2, will learn basic logic using ScratchJr visual programming language in order to design animation and games. The goal is to introduce kids to programming and game design concepts without all the complex programming. Every student will storyboard and present their game at the end of the week! 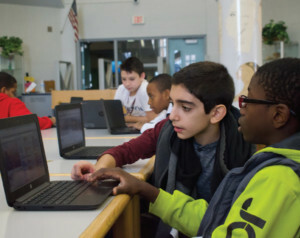 Campers will learn to code using Scratch visual programming language to design simple games like a Maze. The goal is to introduce students to simple programming concepts, design a game, and implement coding logic. Every student will storyboard and present their game at the end of the week, and receive a t-shirt and pizza for lunch on the last day of camp! 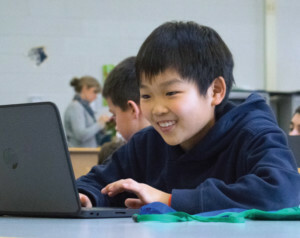 Campers will code using Scratch visual programming language to design a game like Frogger. The goal is to introduce students to more advanced programming concepts, design more complex games, and implement coding logic. This is a great starting point for older children with little or no prior experience. Every student will storyboard and present their game at the end of the week and receive a t-shirt and pizza for lunch on the last day of camp! 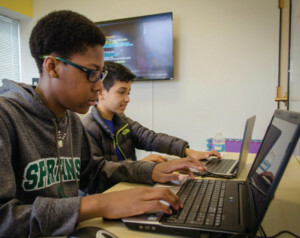 Campers will be introduced to and code with the Python programming language to design games like Slither, using Pygames. The goal is to introduce a more versatile coding language to students, program games and understand syntax. Every student will storyboard and present their game at the end of the week, and receive a t-shirt and pizza for lunch on the last day of camp! 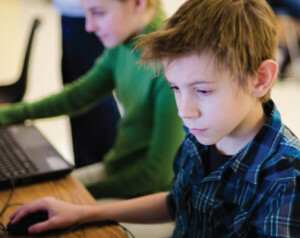 Campers will be introduced to and code with the widely used programming language, Java, to develop an app-like game. The goal is to introduce the Java language, learn syntax and build a simple game app. Every student will storyboard and present their app program at the end of the week, and receive a t-shirt and pizza for lunch on the last day of camp! We offer many fun ways to learn about hardware including robotics, 3D printing and computer building. We offer Dash Robots for young kids and LEGO Mindstorms for advanced kids. 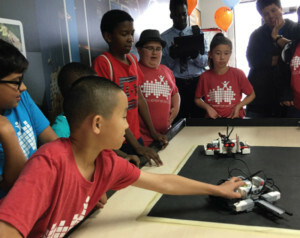 They can also learn about 3D modeling and building their dream computers. Young campers will learn about robots, using Wonder Workshop Dash, and coding, using Blockly visual programming language. 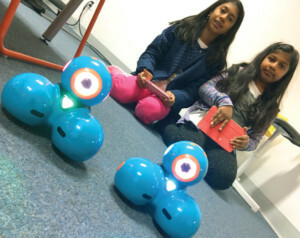 The goal is to introduce kids to autonomous robots, complete fun tasks and design simple programs. Every student will storyboard and compete in the challenge at the end of the week! 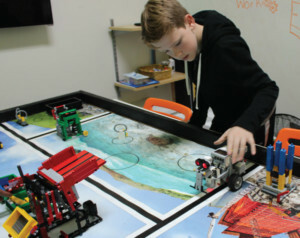 Campers will learn about robotics, using LEGO Mindstorms, and coding, using EV3 visual programming language. The goal is to understand how to program the LEGO Mindstorms, complete tasks like the Roomba, and learn about autonomous robots. Every student will storyboard and compete in the challenge. Campers will learn programming with LEGO Mindstorms robot and the EV3 visual programming language to complete challenging tasks. The goal is to understand how to program the LEGO Mindstorms, complete tasks like the Candy Cleanup, and learn about autonomous robots. Every student will storyboard and compete in the challenge at the end of the week and receive a t-shirt and pizza for lunch on the last day of camp! 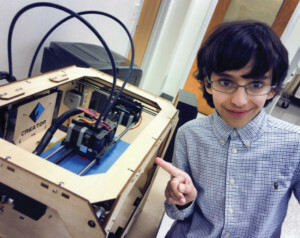 Campers will learn about 3D modeling using TinkerCAD and printing technology using 3D printers. The goal is to learn how to design a 3D model, apply concepts such as additive and subtractive design, and print using our Force Forge 3D printers. Every student will storyboard and present their 3D project at the end of the week! 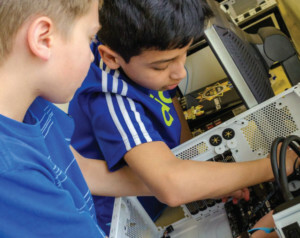 Campers will build a desktop computer from scratch. The goal is to learn the key parts of a functional computer, how to assemble the parts, learn computer settings and install Linux operating systems. Every student will design their own dream computer and present their build at the end of the week! Gaming is a great way to learn about game design and computer programming. 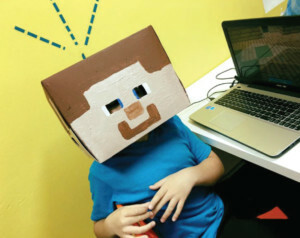 Kids can play and create their own mini-games using the favorite video games including Minecraft, Roblox and Fortnite. 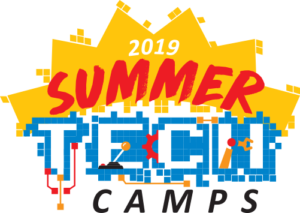 We have tech camps for all ages. 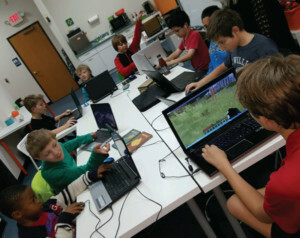 Campers will learn and use the Minecraft PC Edition in creative mode. 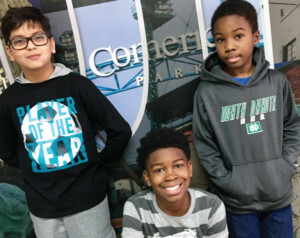 The goal is to have students understand this popular sandbox game, know the items and features, and build an amusement park while learning basic concepts of game design. Every student will storyboard and present their Minecraft world project at the end of the week and receive a t-shirt and pizza for lunch on the last day of camp! Campers will learn and use the Roblox online studio to design, construct and play. The goal is to have students understand the virtual game, know the toolbox and features, and build a racing game. Every student will storyboard and present their project at the end of the week and receive a t-shirt and pizza for lunch on the last day of camp! 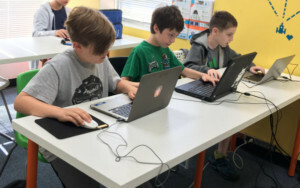 Campers will create their own Minecraft server and push their creativity to the limit by designing multi-player mini-games, like Spleef, for their friends to play. 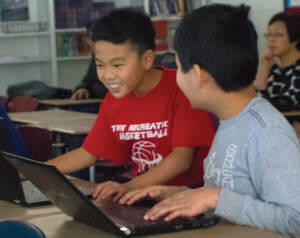 The goal is to have students understand how to build a server, develop a mini-game, and create their own Minecraft world. Every student will storyboard and present their project at the end of the week and receive a T-shirt and pizza for lunch on the last day of camp! 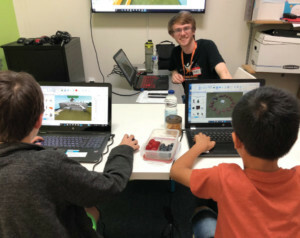 Campers will learn and use the Roblox online studio to design, construct and play a game of their own design. The goal is to have students understand the virtual game, know the toolbox and features, and build an elaborate capture the flag arena. Every student will storyboard and present their project at the end of the week and receive a t-shirt and pizza for lunch on the last day of camp! Campers will learn and use Fortnite’s creative mode to design, construct and play. The goal is to have students understand the virtual game, know the toolbox and features, and build their own multiplayer experience. Every student will storyboard and present their project at the end of the week and receive a t-shirt and pizza for lunch on the last day of camp!